Immunogen: Synthetic peptide corresponding to aa 623-638 of mouse ERp72. Scientific Background: Endoplasmic reticulum protein (ERp) 72, a 72 kDa protein localized to the endoplasmic reticulum, is a member of the Protein Disulfide Isomerase (PDI) family of proteins. Together with other ER resident proteins such as BiP, GRP94, and PDI, they serve as the molecular chaperones for proper folding of newly translocated and glycolsylated proteins such as Thyroglobulin (Tg) and Human chorionic gonadotropin (hCG)-beta. Technical Info/Product Notes: Recommended by the Human Protein Atlas Organization for IHC (Ensembl No. ENSG00000155660). 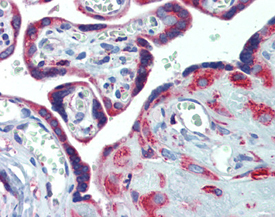 IHC Analysis: Human prostate tissue stained with ERp72, pAb at 10µg/ml. 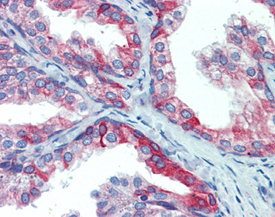 IHC Analysis: Human placenta tissue stained with ERp72, pAb at 10µg/ml. 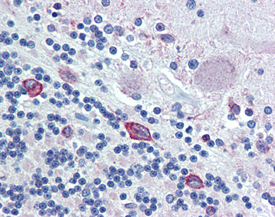 IHC Analysis: Human brain, cerebellum tissue stained with ERp72, pAb at 10µg/ml. Western blot analysis of ERp72: Lane 1: MW Marker, Lane 2: Rat Liver Microsome Extract, Lane 3: Mouse Liver Microsome Extract, Lane 4: Human Liver Microsome Extract. 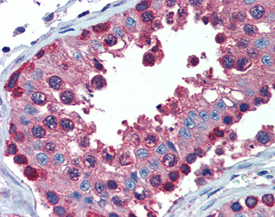 IHC Analysis: Human testis tissue stained with ERp72, pAb at 10µg/ml.